As of 10/31/18, the recreational swimming season for 2018 has concluded. The HAB Task Force has discontinued water sampling for Lake Anna. Samples were collected on Tuesday Oct. 23rd in the Pamunkey and North Anna Branches in addition to one site south of Rt. 208 in Fisherman’s Cove (on north shore). A summary of results are below. Coves, shallow areas, and shorelines may have scum present. Avoid contact with scum. Be aware of the bloom in these areas as water conditions may fluctuate. Cyanobacteria were detected but at levels which should not pose a health concern. VDH will continue to update the HAB Map with citizen reports of scum. To submit a scum report or fish kill visit the online HAB report page. Scum reports (which have not been verified) are symbolized in the HAB Map with blue circles. People visiting the lake to boat or fish should be mindful of blooms which may be ongoing on the Lake and avoid areas with green scum on the water. Scum is more likely to accumulate in shallow areas and along shorelines. 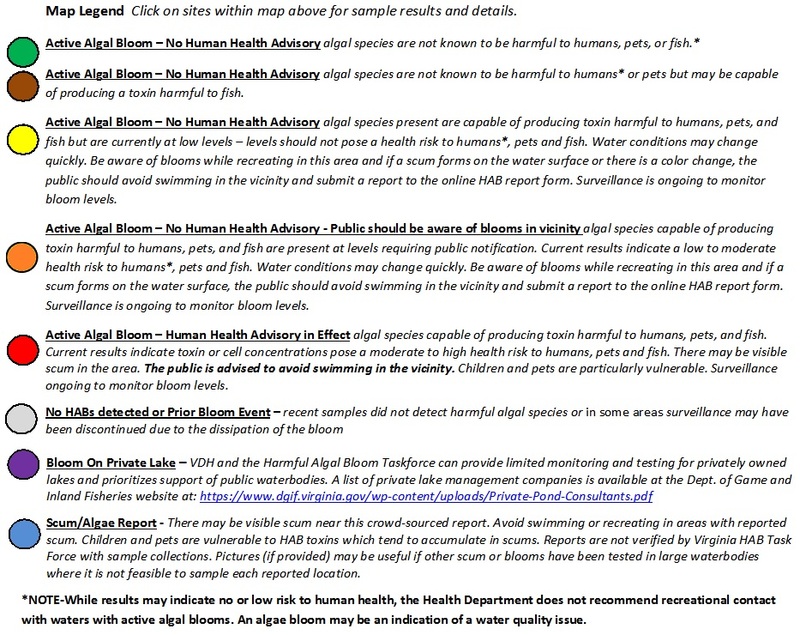 Signs similar to the one depicted at right, may be downloaded, laminated, and placed around the watershed to raise awareness about algae blooms during the off season. Signage and awareness will decrease the likelihood of a human or pet exposure during “off-season” months while sampling and advisories for recreational use are not being conducted. Do not let children, pets, or livestock get into or drink water from natural waterbodies. Avoid direct contact with water that has unusual color or where there is a visible scum on the water surface. If you or your pet are possibly exposed to algae bloom water, wash off with clean fresh water. Use rubber gloves if contact with waters containing a scum is unavoidable. If you or pets are exposed to a bloom and/or suspect you are experiencing health effects, consult your local health care provider/veterinarian. into contact with the fish. Review the algae bloom map for sites of crowd-sourced scum reports. Report health effects which are believed to be a result of exposure to an algae bloom on the HAB Hotline at 888-238-6154. Double-click on the map in the area of Lake Anna (north-west of Richmond) to zoom in- Expand the map [ ] and click on dots to review sample results for each site. The color legend for the HAB Map is below. The 9,600-acre lake is a popular recreational and vacation destination. Lake Anna State Park, which features a swimming beach and boat ramp, is located at the confluence of the Pamunkey and North Anna Branches of Lake Anna. Several marinas and a campground are also along the shores of the Lake. The “hot-side” of Lake Anna is privately owned and not publicly accessible. 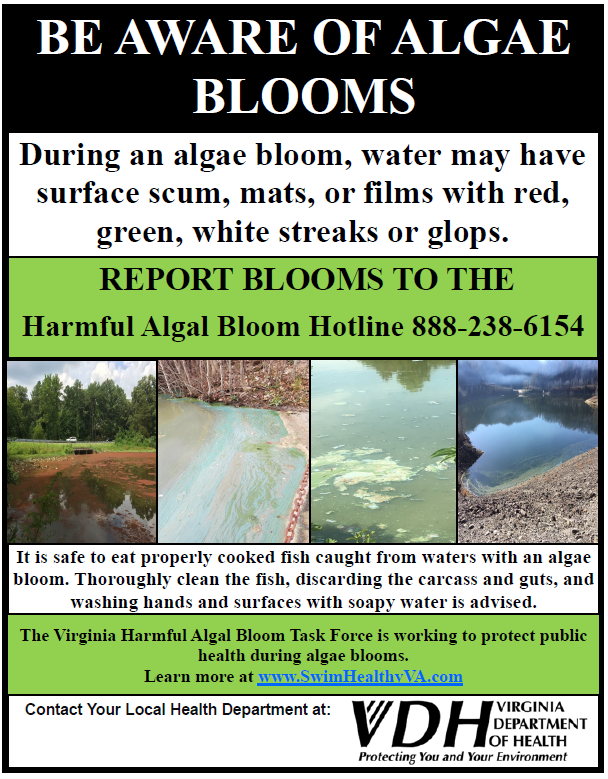 If you would like to submit a HAB report online for blooms/fish kills on the ‘hot side’ VDH will forward your complaint to Dominion Virginia Energy. The water quality on Lake Anna has the potential to be vary from one area to the next. Officials can only speak to the results which have been collected and recommendations are based on cyanobacteria concentrations at the time of collection. 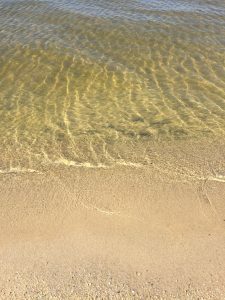 The public is encouraged to be aware of algae blooms while on the lake when in areas which have not been sampled and to watch for areas where there is a color change or where there appears to be a scum or film present. In addition, all natural bodies of water contain viruses, protozoans, and bacteria which may pose health risks, especially following rain events. The VDH advises the public to avoid swimming after rain events. Picture is of Lake Anna State Park Beach courtesy of DCR. Click HERE for VDH press releases issued for HABs in 2018. For information HABs in the Dominion Virginia Power Waste Heat Treatment Facility lagoons (WHTF, private property) please visit the Dominion Energy website at: https://www.dominionenergy.com/about-us/making-energy/nuclear/north-anna-power-station/waste-heat-treatment-facility. Sampling locations identified by Dominion Energy are noted on the HAB Map with purple dots (private lake). For visual guides to help identify cyanobacteria, information on sample collection and analysis, as well as brochures and signs available for download, visit our Virtual HAB Toolkit.